Finnish paper and pulp firm Metsä Board has invested €38m in a new extrusion coating line at its paper mill in northern Sweden. The new line at the company’s Husum mill is now producing initial orders. It has an annual capacity of about 100,000 tons. The line, which will serve the worldwide foodservice market, joins a 270,000-tonne linerboard machine and a 400,000-tonne folding boxboard machine that began production at the starting of 2016. It will provide enhanced availability and competitive products. Metsä Board said its PE-coated paperboards respond to the tight requirements of the foodservice market by offering product safety, purity and protection for cups, plates and other forms of takeaway packaging. The company noted that it will continue its development work on other barrier solutions, including the use of bio-based materials. Metsä Board CEO Mika Joukio said: “In developing the new PE coated grades we have utilised our longstanding board making expertise combined with the latest technology. We have an integrated facility at Husum which is a clear advantage. Metsä Board’s lightweight paperboards can be used for consumer goods, retail-ready and food service packaging. The company, which employs about 2,500 people, generated EUR1.7bn of sales in 2016. 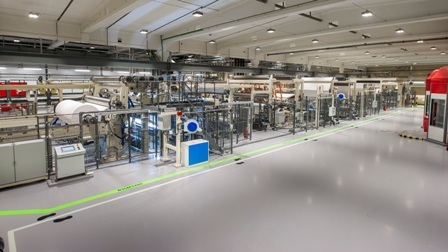 Image: Metsä Board Husum extrusion coating line. Photo: courtesy of Metsä Board.